Description: Pod-Shots are Live Copepods supplied in 50ml & 100ml pouches. Pod-Shots can be used as a live copepod starter culture or live food for your finicky fish eaters. Pod Shots are ideal as they can be posted easily through your letter box if your not home. 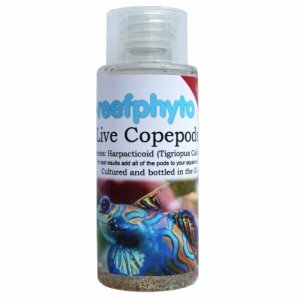 If you require a larger volume of copepods then take a look at our live copepod bottles. Almost any marine aquarium will benefit from the addition of copepods, but tanks with mandarin fish, anthias and seahorses may well require the regular addition of copepods for optimal results. Aquarists that maintain refugium as a part of their overall system should definitely add copepods directly to their refugium on a regular basis. We ship our copepods in a 100ml bottle. To add them to your system, simply pour the bottle directly into the aquarium or use a sieve witch is available as an option above if you require one. If a refugium is present, it may be best to add at least some of the copepods to the refugium where they will not be eaten. If no refugium is present, you may add all of the copepods directly to the sump (consider shutting off the protein skimmer for a time if one is present). If the system does not have a refugium or a sump, consider adding at least some of the copepods when the aquarium lights are off. Which Copepods Do You Stock? We stock Harpacticoids copepods (Tigriopus Californicus) which are the most commonly available copepods on the market today. They are substrate-dwelling copepods (揵enthic" copepods). They feed on micro algae, detritus and even flake fish food. Some harpacticoids are cannibalistic and will eat other copepods if no other food source is present in the aquarium. Why Can't I See Copepods In My Aquarium? Over time, the population of the copepods in your aquarium will decline as they are grazed by the corals, anemones, fish and shrimp in the tank. How Do Copepods Help My Aquarium? As well as being an excellent food source for finicky fish eaters, they are "detritivores", meaning they will scavenge leftover fish food, fish poop, and bacteria in the tank. They can help control the water quality by eating the unused food which can eventually lead to bacteria overload in your tank. If a refugium is present, it may be best to add at least some of the copepods to the refugium where they will not be eaten. If no refugium is present, you may add all of the copepods directly to the sump (consider shutting off the protein skimmer for a time if one is present).